Losing 3 pounds right after pigging out for the holidays should be easy. If I find that I lose all that weight in the first two weeks, I’ll adjust the goal up a few pounds. I would love to lose 20 pounds this year, but I’m only focusing on the first 7 1/2 weeks right now. Working out 24 times will push me a little. My plan is to run 3 times a week and fill in the extra times I need with doing the Ripped in 30 DVD. Since Christmas day I’ve done the DVD 3 times. It’s hard! Today I ran 2 miles. I’ve ran only one time since Thanksgiving. It felt good to get out again. I’m taking advantage of the nice weather. We had some wet and windy days (including ice) last week. Today I had sun and 43 degrees! In other news, everyone seems to be healthy! Audrey is feeling better. 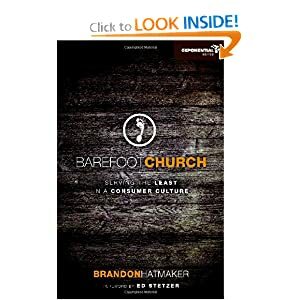 Barefoot Church: Serving the Least in a Consumer Culture by Brandon Hatmaker. I started a few days before New Year’s Day. I have 20 pages left. I’m really enjoying it. It really makes you think about how we do church. That means I have 4 more books to read in the next 7ish weeks. What books do you suggest? Any genre!